Just three more days before Christmas! Have you made up your mind on what to prepare for your Christmas feast??? I've shared an album of some Favorite Filipino Christmas Food on Facebook that you might want to add to your menu. :) And now, I have here another dessert that I'm sure you will like. 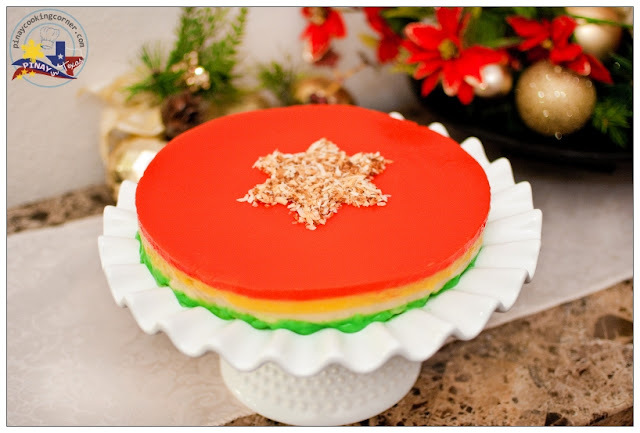 This is popularly served in the Philippines on special occasions and during holiday feasts, and is called Sapin-Sapin. I've actually featured a variety of this dessert before which is almond and pandan flavored. This time, I decided to make a Christmas version of it. 1. 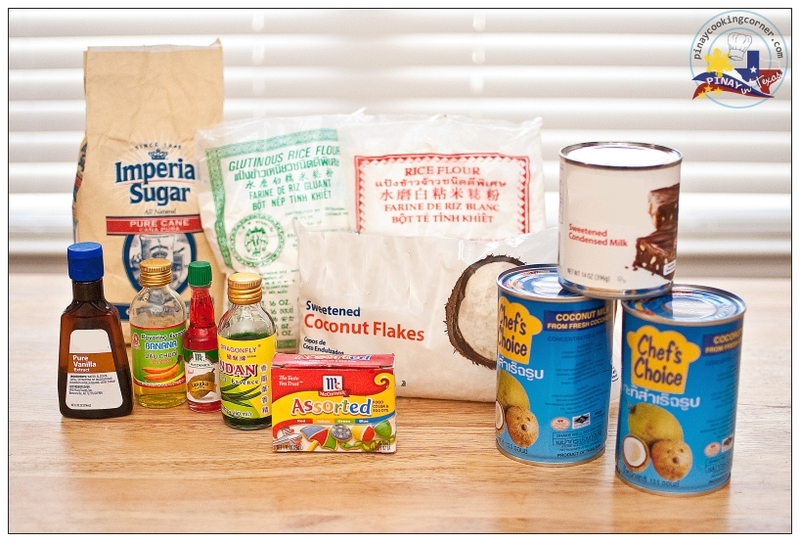 Mix glutinous rice flour, rice flour, sugar, coconut milk and condensed milk in a bowl. Whisk out any lumps, ensuring the mixture is smooth. 2. Divide batter into 4 equal portions. To one portion, add vanilla extract. Mix well. 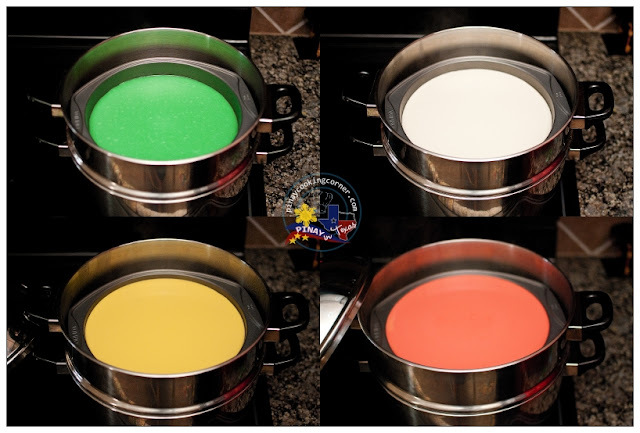 To the 2nd portion, put ¼ tsp pandan extract and 4 drops green food color. Mix well. To the 3rd portion, put 1/8 tsp langka extract and 4 drops red food color. Mix well. To the last portion, put 1/8 tsp banana extract and 4 drops yellow food color. Mix well. 3. Grease a 9x9 square or 9 in diameter round baking dish or pan. (If you have banana leaves, it would be advisable to cover the bottom and sides of the pan so that tranferring to a serving platter will be easier.) Pour the green pandan mixture. Spread evenly. Put a cloth under the steamer cover to prevent water from dripping to the sapin-sapin. Steam for 30 minutes or until firm. Pour white batter on top of the cooked pandan mixture. Cover the steamer again and steam for 30 minutes. Lastly, pour in the red batter. Again, steam for 30 minutes or until firm. Carefully remove the Sapin-Sapin from the steamer and allow to cool completely. Transfer to a serving platter. Cut into wedges or squares and sprinkle toasted coconut on top. Excellent colourful dessert. A real royal treat. Tina, I love this dessert. I am pinning it in group board and sending invite also. loved your cakes. This looks so colorful. Thanks Pinay ,you finally thought of visiting me. 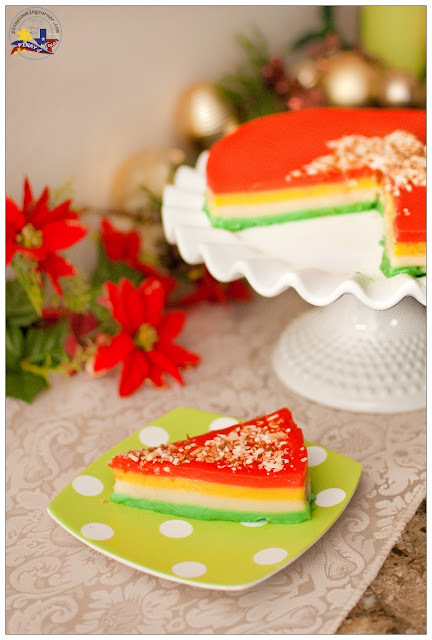 I love this tricolored cake very christmassy! Tina , love this colorful treat ! Very festive and looks delicious :D Happy Holidays !!! I will try to make this tonight. 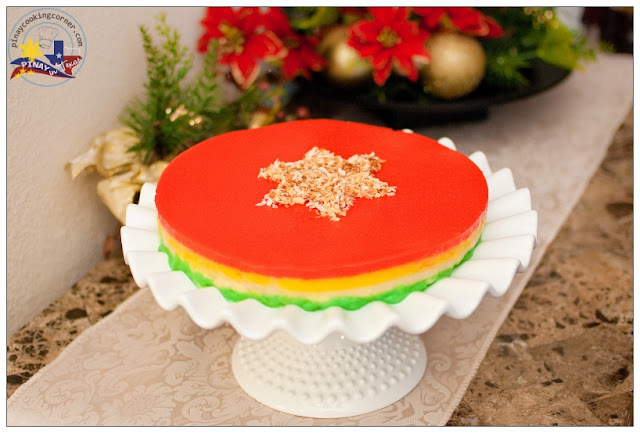 I'm not sure why your sapin-sapin came out hard. I have used this recipe a number of times and the texture always turned out perfect. Anyway, you can always adjust the consistency of your batter before steaming it. It shouldn't be too thick, coz the thicker the batter is, the harder your sapin-sapin will be. If while mixing, you find your batter thick, just add more coconut milk, 1 tablespoon at a time until you attain the desired consistency, i.e., not too thick but not too liquidy as well. pwede po ba kahit two color lang? where did u buy the langka extract? Got it from the nearby Asian Store. If you used the exact measurements in the recipe, you shouldn't have that problem. I will try this as soon as I get all the ingredients.